Scramble eggs lightly in a bowl with a tablespoon of water. In a medium non-stick skillet, add a swirl of olive oil and place over medium heat. Once oil is hot, add eggs. Use a flat spatula to move cooked egg carefully to the center and allow uncooked egg to flow to the outside. When the eggs are set on the bottom but still a bit runny on top, add filling to half of the egg and carefully fold egg over to enclose the filling. Let cook for another few minutes to finish cooking eggs and heat up filling. 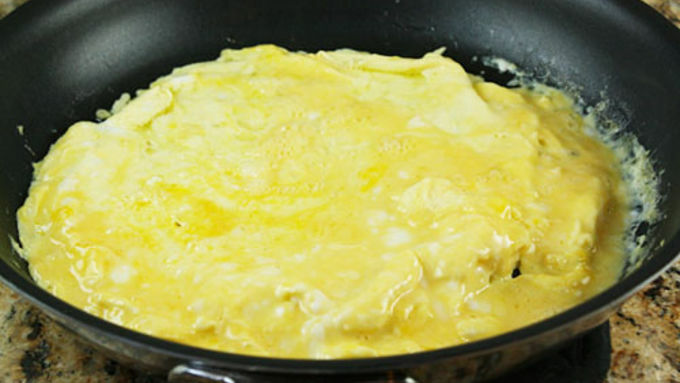 To finish cooking the eggs, it might help to either cover the pan for a minute or two or carefully flip the omelet with a spatula so that the other side of the omelet gets some heat also. Serve with a pinch of salt and pepper and hot sauce. This is a big omelet and might be enough to split depending on how hungry you are. Greek flavors are some of my favorites, and my definition of classic Greek food is spanakopita. 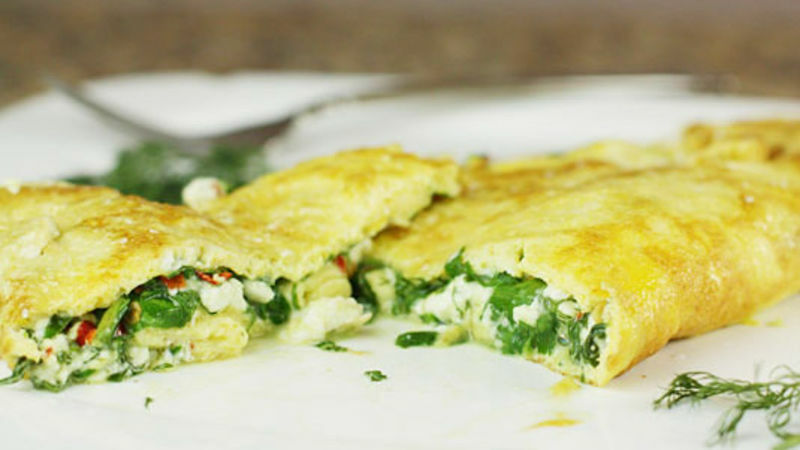 Now, you might wonder why I'm mentioning spanakopita when I'm clearly making an omelet... Because this omelet is basically stuffed with spanakopita filling! 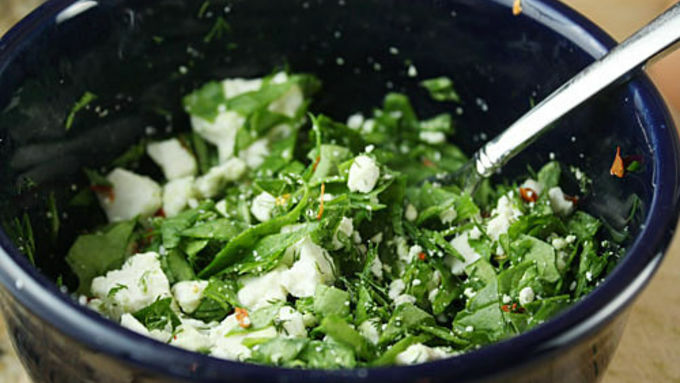 The combination of spinach, fresh dill, and salty feta cheese is almost good enough to just eat with a spoon. But stuffing it into a light and fluffy omelet is even better—and a whole lot easier than making the traditional puff pastry dish! This recipe takes no time to make. It's important to get really fresh ingredients though. A few fresh eggs, good feta cheese, and fresh spinach and dill will make this dish pop with flavor. To make your life easier when you're making the omelet, I recommend mixing your filling ingredients prior to cooking your omelet. Just chop up the spinach and mince the dill really finely. Then crumble in the feta and red pepper flakes if you're using them. When it comes time to make the omelet, the key is to not stress out about it! 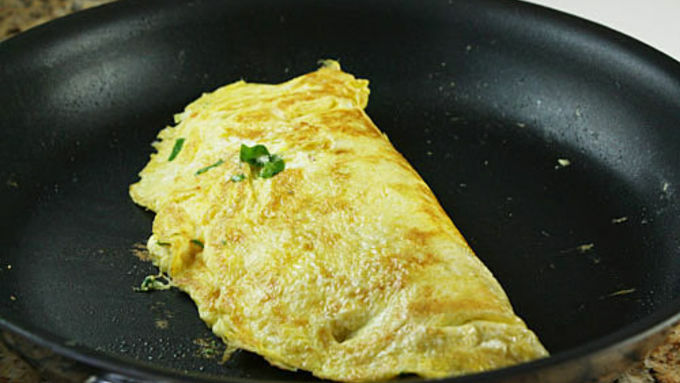 Remember that even if your finished omelet doesn't look perfect, it will taste delicious. Since this is a pretty big omelet, I upgraded my pan size a bit. 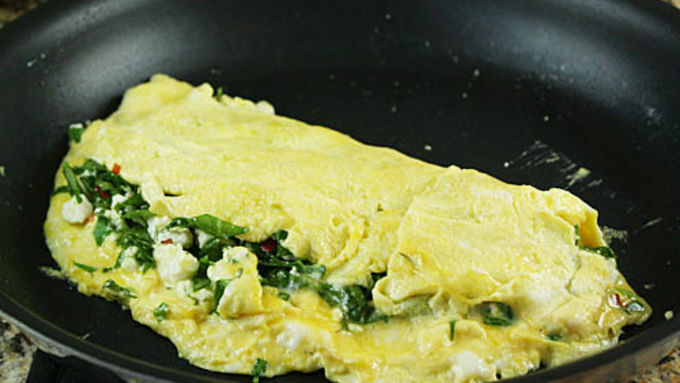 You can use a smaller (10 inch) omelet pan if you don't mind your eggs being a bit thicker. Or you can decrease the number of eggs down to two. This omelet was almost big enough for two. I say almost because I had no problem finishing it all by myself. 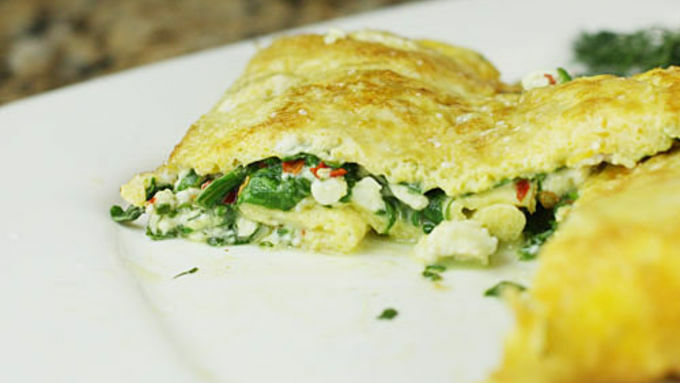 If you're looking for a new omelet filling option, give this a shot!